Judged by the proliferation of research-inspired ventures, it may seem that we are in a golden age of philanthropic knowledge creation. Given the urgency of finding better ways to solve pressing social issues, it is not surprising that the vast majority of the research generated is applied research. 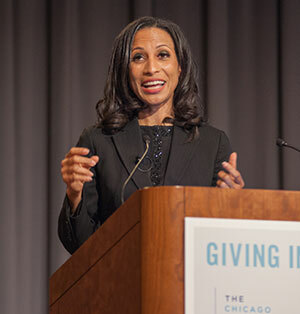 Both the standard ways of doing philanthropy and the paradigm-bending (and busting) efforts to transform and disrupt conventional approaches come armed with research findings on what works, where there are strategic gaps in expectations among key players, and how some interventions are more effective or efficient than others. This data-driven search for solutions is awesome and inspiring. However, basic research is needed to give more coherence to this burgeoning research engagement, and to give it an even better chance at driving future innovation. There are shared fundamental questions that can tie this research together. We just need to devote some patience to pursuing basic questions, such as why do humans give? How does giving affect our social life? And how is giving connected to exchange relations in the market and to the power relations of authority? Such “useless knowledge” now resides in every smartphone built from “basic” discoveries that in their time did not have ready uses, ranging from electricity to relativity to quantum mechanics. In the social sciences and humanities, basic research leads to novel designs for our social institutions (think of social security and public health) and to the ways we form our identities, express them and find meaning. Our current philanthropic research ecosystem is highly fragmented and its inhabitants often belong to a variety of industries or professions whose connection to philanthropy is contingent on other interests and commitments. And we are in a time when there are also growing expectations of philanthropy that are only likely to increase, not only because of current political winds, but also because total annual giving at $390 billion does not seem all that small when compared to the nonmilitary portion of federal discretionary spending that stands at $518 billion a year. In addition, alarm is being raised about declining government investment in basic research, including by the president of MIT and the head of the Institute for Advanced Study, Einstein’s academic home. Realistically, only a small portion of flagging government support for basic science research will be funded by philanthropy. But even the campaign to fund basic science through philanthropy would benefit from a better fundamental understanding of philanthropy. We are likely to see many more efforts to tap into philanthropy or to regulate the flow of financial resources into it. The different decisions made would benefit from a better understanding of what “it” is. Is philanthropy a tax dodge, the outsourcing of government, an agent of pluralism, or is it its own thing that reflects a fundamental feature of the human condition. It can be all of these things, but it is the last one that merits more attention. We often hear suggestions that the market or the government would do philanthropy’s work better. One can make that argument, but it is one that seeks not to improve or understand philanthropy, but to substitute it for something else. This tells us that basic research on philanthropy is not going to succeed by walling itself off from other disciplines and ways of approaching human nature and social interaction. But at the same time, if there is a basic puzzle to investigate that focuses on the how and why of human generosity, we cannot simply follow the practitioners and thinkers who consider philanthropy to be an offshoot of market behavior or authority relations that can be managed and understood better by using only these more established lenses. They are generating ever more sophisticated and useful syntheses, deep dives, case studies, data tools and research reports. The Gates-funded Giving By All initiative is fostering a range of applied research on interventions that might facilitate more donations by the public at large. Even following the Stanford Social Innovation Review only begins to reveal the expanding universe of applied research and experimentation. Our field is replete with excellent associations and consultants who serve as the McKinseys and Bains of the philanthropic world. However, we are not so blessed with the equivalent of the multitude of excellent business schools in the world of commerce that build knowledge and allow us to discern among the flurry of urgent insights by providing rigor and the perspective of broader and longer context. We in the academic world have simply not kept up with the pace of innovation and experimentation that is being driven by research-savvy practitioners. We have not done an adequate job of building the connective sinews, as basic and applied research do not progress in isolation. They benefit from cross-pollination and creative tension between curiosity driven basic questions and applied discoveries. And more broadly, there has been dramatic growth in the number of academic programs that teach about philanthropy. These are mostly found in schools of public affairs and public policy, where “nonprofit management” is a growing line of instructional business. But here too, more connective tissue needs to be grown to connect data-driven innovators on the one hand and scholars outside the professional school domain on the other. Our understanding of philanthropy and our quest to make it more effective will benefit from embracing curiosity-driven research that seeks to understand what ties our disparate concerns together in the pursuit of basic questions about human generosity. Tax policy changes proposed by Congress and the Administration would reduce charitable giving by up to $13.1 billion, new research from the Lilly Family School of Philanthropy indicates. The study was commissioned by Independent Sector with funding from Leadership 18. 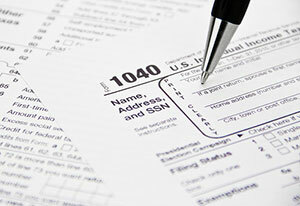 The report found that lowering the top marginal individual income tax rate and increasing the standard deduction would lower charitable contributions both separately and when combined. The research also estimates that adding a charitable deduction for non-itemizing taxpayers to those policy proposals likely would more than offset the loss in charitable giving from the proposals and generate up to $4.8 billion in additional charitable giving. 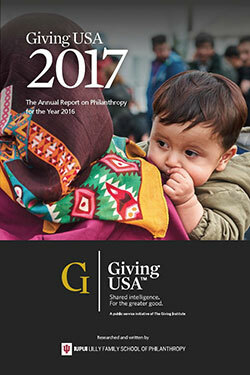 Driven by a nearly 4 percent increase in giving by individuals, total U.S. giving from all sources rose to a record $390.05 billion in 2016, according to Giving USA 2017: The Annual Report on Philanthropy for the Year 2016. Giving USA is published by Giving USA Foundation and is researched and written by the Lilly Family School of Philanthropy. “Individual giving continued its remarkable role in American philanthropy in a year that included a turbulent election season that reflected a globally resurgent populism,” said Amir Pasic, Ph.D., the Eugene R. Tempel Dean of the school. Charitable giving from individuals, foundations, and corporations all increased in 2016, while gifts by estates decreased sharply. Contributions to all nine major philanthropy subsectors increased for just the sixth time in the last four decades. Giving to arts, health, international affairs, and the environment experienced significant growth in 2016, while giving to education saw relatively slower growth compared to recent years. 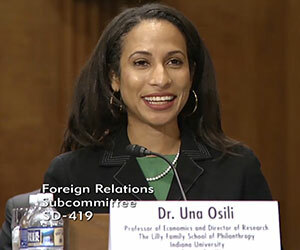 Private philanthropy funds more international assistance to developing countries than government, Lilly Family School of Philanthropy associate dean for research and international programs Una Osili, Ph.D., recently told senators at a subcommittee hearing, adding that U.S. private philanthropy and remittances are an important and growing part of the country’s overall foreign aid to those countries. Global philanthropy, remittances, and international development were the focus of a hearing held by the Senate Foreign Relations Subcommittee on Multilateral International Development, Multilateral Institutions, and International Economic, Energy, and Environmental Policy, which is chaired by U.S. Senator Todd Young (Ind.). “U.S. government and private economic engagement with developing countries was estimated at $365 billion in 2013-2014, according to the Index of Global Philanthropy and Remittances (IGPAR),” Osili said. Government official development assistance was approximately $33 billion, or 9 percent of the total. Private U.S. sources provided nearly $332 billion, including $44 billion (12 percent) in private philanthropy, $109 billion (30 percent) in remittances from migrants to their home countries, and $179 billion (49 percent) in U.S. private capital flows. The Lilly Family School of Philanthropy recently began researching and producing the IGPAR and the Index of Philanthropic Freedom. Osili is a long-time advisor to both indices, which were founded and produced until 2017 by the Hudson Institute Center for Global Prosperity. She also leads the school’s other research on international philanthropy. 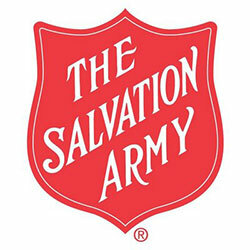 Nationally, the latest quarterly update of the Human Needs Index (HNI), a joint project between The Salvation Army and the Lilly Family School of Philanthropy, reveals that the level of American need in 2016 remained fairly stable compared with 2015. Several states, however, continue to struggle at levels of need that are above the national average. “Pockets of persistent poverty remain throughout the country. Need is especially prevalent in western and Rust Belt states,” said Una Osili, Ph.D., associate dean for research and international programs for the school. In 2016, the states with the highest Human Needs Index values were Nevada, Wyoming, Pennsylvania, Alaska, and Arkansas. Looking at the past three years of data, Nevada, North Dakota, Pennsylvania, Michigan, and Kansas have remained among the 10 states with the highest level of need.